The Amver participating bulk carrier Noni rescued 4 people from a disabled sailboat approximately 500 miles off the coast of Brazil on Sunday, January 22, 2017. The crew of the Noni overheard a mayday radio broadcast and notified rescue personnel in Brazil and the Amver center. According to the report from the Noni, a sailboat radioed their engine failed and the vessel was flooding. The crew of the Noni was only two miles away and altered course to render assistance to the disabled sailboat. Two hours after receiving the distress call the crew of the Marshall Island flagged ship was safely alongside the sail boat and hoisting the four survivors aboard the ship. The survivors were uninjured and had been on a voyage from Dakar, Senegal to Brazil when they reported an engine failure and water coming into the boat. The survivors will be disembarked at the Noni's next port of call in Uruguay. 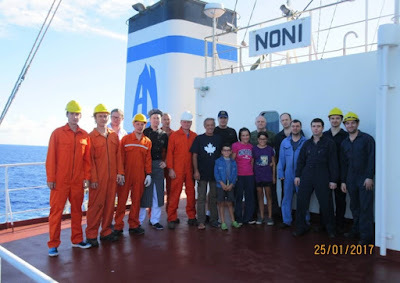 The Noni, managed by AM Nomikos Transwolrd Maritime Agencies of Greece, enrolled in Amver on July 2, 2015 and has earned one Amver participation award.